Your knee doesn’t have to hurt when you run! Did you know 80% of runners will be injured in a 12 month period? Studies show that at least 1 in 4 runners will suffer from knee pain during this time. ‘Runner’s knee’ can be caused by two conditions: patellofemoral pain syndrome (PFPS) or iliotibial friction syndrome (ITBFS) and both are preventable and treatable conditions. PFPS is the most common cause of pain at the front of the knee. The patella (kneecap) sits in a groove at the end of the femur (thigh bone). When the knee is bent and straightened the patella should glide up and down in this groove. Often a muscle imbalance is present which causes the kneecap to sit laterally in the groove. Knee movement now irritates the cartilage behind the patella when it doesn’t glide smoothly. Over time this can lead to a condition called chondromalacia patella or softening and wear and tear of the patella cartilage. Pain at the side of the knee is typically caused by ITBFS. The ITB is a thick piece of connective tissue that runs down the outside of the thigh. Similar to PFPS, ITBFS is often due to a muscle imbalance around the knee. Weakness through the gluteals and inner thigh combined with tightness in the outer thigh cause the ITB to rub over the end of the femur. Other factors that can lead to knee pain include excessive training, poor or old footwear, wider pelvis particularly in females, weakness in the calf and gluteal muscles and poor running technique. If you are a runner with a sore knee the first thing to do is make an appointment to see one of our physiotherapists for an accurate assessment and treatment plan. Please call or book online to see one of our Physiotherapists. 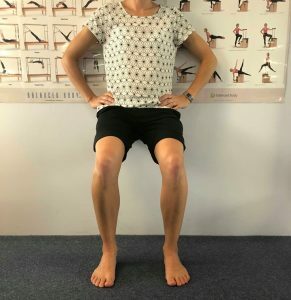 This post was written by Lucy Beumer, Sports and Exercise Physiotherapist and Clinical Pilates Instructor at Stafford Physiotherapy and Pilates.